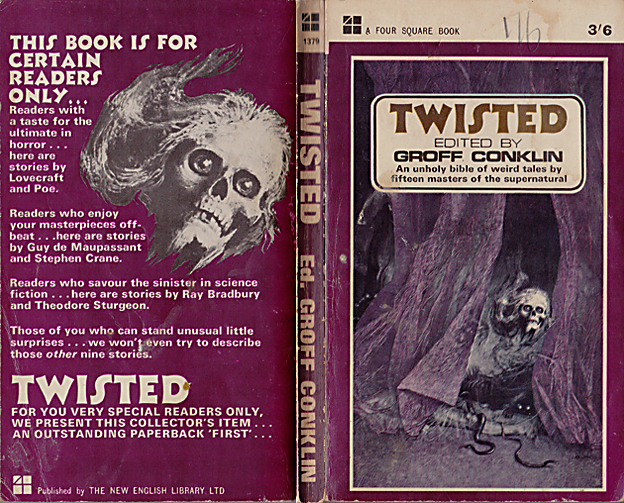 I know very little about Groff Conklin, other than he has a name that sounds like an adjective and condition (i.e. I can’t come into work today as I have a bit of a groff conklin). Apparently he’s more of a sci-fi anthologiser but here he’s strayed into horror with “an unholy bible of weird tales by fifteen masters of the supernatural”. Perhaps it is something like taking a smallpox vaccination to immunize ourselves against smallpox. We counter the black-magic bacillus of a cruel and often supernatural reality with the white-magic antibodies of a purely literary, unreal credulity. The cover art is a little unclear as to what’s going on. We have a flying skull appearing from the gap in a pair of purple, diaphanous drapes. But look there on the floor. Is that a corpse that the black tentacles are slithering over? And look beyond the corpse, we have a hint of the being from which the tentacles are coming, with its gaunt rib-like structure and glowing eyes. The Song of Marya – Walter M. Miller, Jr. This is a remarkable tale from Miller, author of the post-apocalyptic epic A Canticle for Leibowitz. Miller served as a tailgunner during WW2 and was involved in a bombing raid on a Benedictine Abbey which traumatised him (he converted to Catholicism after the war), so much of his work has an anti-war theme and this is no exception. First published in 1957, this story is set in an unspecified near future at a time when the cold war has got completely out of hand and we’re in the middle of a Communist Russia being invaded by a Fascist USA under the leadership of the “megalomaniac evil genius” General MacAmsward. Now, I’m no expert on US military history but one can’t help feeling there may be shades of General Douglas MacArthur here. …he reminds me of one of their earlier generals, thirty years ago. But that was before their Fascism, before their Blue Shirts. The story itself concerns a young woman, the eponymous Marya Dmitriyevna, who lost her baby Nikolai during an American bombing raid the day before the tale opens. Marya is tasked by a Russian colonel to find, allow herself to be seduced by, and assassinate General MacAmsward. No conventional weapons can be used as she would be searched, so it has to be a suicide mission whereby she is injected with a slow acting bacteriological weapon which will contaminate her breast milk which she must feed to the General. Yes, you read that correctly! This tale is often anthologised under the title Vengeance for Nikolai. He was not a tramp, he was not one of the summer people. Brenda knew at once that he was not like any other man she had ever seen. His skin was not black, or brown, but of an inky grayness; his body was blobbish and irregular, as if it had been shaped out of the clots of soap and grease that stop up kitchen sinks. He held a dead bird in one crude hand. The rotten smell was welling out from him. She teases the figure into chasing her and, when he does, she traps him in the old quarry that exists in the middle of the island. No one knows what was ever quarried there. …I think that is why he came to Moss Island in the first place. Hunting. He is old. Has been the way he is for a long time. I think he wants to be born. What follows, right up to the enigmatic denouement, is a strange and fairytale-like piece which I think works on an allegorical level in much the same way, and exploring similar themes, as Angela Carter’s work. I know that Margaret St. Clair had an MA in Greek Classics and often referenced Ancient Greek mythology in her work and I wonder if this story is one of them, it certainly seems to allude to something far deeper than story’s surface level. What I could I possibly say about this one that hasn’t already been said? It’s a classic. We all know it. We all love it. How about we sit back and watch Charles F. Klein’s 1928 expressionist adaptation instead? It’s good to see one of my favourites of Lovecraft’s included, The Shunned House isn’t as anthologised as often as it should be. This is Lovecraft’s take on the classic haunted house tale and a fine example of how he takes a standard theme and pushes it just that little bit further than most. He begins with grounding the tale in reality and immediately instils a sense of dread by relating the irony of the fact that Edgar Allan Poe would often walked past this particular house during his “…unsuccessful wooing of the gifted poetess, Mrs. Whitman”, little knowing that the house stood “…starkly leering as a symbol of all that is unutterably hideous”. We then have a history of the house, along with all of the deaths and disasters that have befallen its residents, narrated by a local man investigating the house along with his antiquarian uncle. We’re given hints to folk superstitions of ghosts and vampires during the narration and the centre of the activity is in the cellar, the earth floor of which is covered in patches of phosphorescent fungi. It’s not until the final act, when the narrator and his uncle are spending the night in the cellar that Lovecraft pulls out his trump card. Most authors in the genre, after creating such a set-up would go on to give the reader a ghostly apparition or indeed a vampire for the denouement. Even the protagonists arrive prepare for either of these eventualities. But Lovecraft, as is his wont, gives us something a little less explicit and a little more inter-dimensional! Absence makes the heart…etc. etc. Thankyou very much, Mr. Unsubscriber. I bet you’ve got the original Belmont? Nice. Wishing you and your conklins well!